Mark Levinson’s new documentary Particle Fever is about relationships … relationships between scientists who practice theory and those who put theory into practice. It is about particle physics, or those parts that are observed, examined, and scrutinized in an effort to come to some understanding of a whole. Pieces of things. Particles of things. In the plunge ahead, Particle Fever highlights the search for the Higgs Boson, or “the God particle”. Scientist Peter Higgs talked about its existence, but there was no proof that this particle had or does exist. How do we prove it? We build a machine to find it! 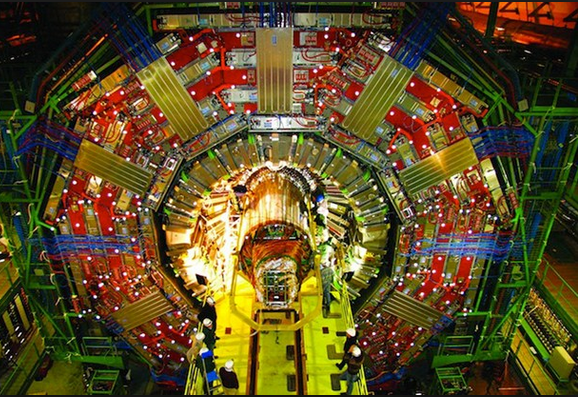 Levinson’s documentary highlights the Large Hadron Collider, man’s latest scientific feat in building machines. It is gargantuan, and seeing it onscreen, I very well can imagine Henry Adams’s wonder at the 40 ft Dynamos he observed at the World Columbian Exposition in 1893. The Large Hadron Collider is the world’s largest and most powerful particle accelerator built by the European Organization for Nuclear Research in Lucerne Switzerland. It will be used to prove Peter Higgs’s theory of the existence of “the God particle”. The careers are riding on this discovery, and if one jot or tittle of a particle is left out, it could mean failure! It could mean disaster! It could mean humiliation! Oh, the catastrophe! But, Levinson so ably orchestrates a cadre of belief—no—faith among colleagues that is so compelling, you will want to put on your hard hat and overalls and see that project through! Particle Fever plays through May 8 at The Ross Media Arts Center in Lincoln. Watch for film, television, & more!